Sources from U.S. carriers who spoke with AllThingsD on Tuesday revealed that they are disappointed by the number of iPhone 5s shipments they are receiving from Apple. Sales of Apple's next flagship handset will begin online Friday at 12:01 a.m. Pacific, while Apple's retail stores will begin selling the iPhone 5s when they open at 8 a.m. local time. Tuesday's report also revealed that carriers may be seeing less demand for the iPhone 5s than expected. That's attributed to the new mid-range, multi-colored iPhone 5c, which may be proving more popular than some had anticipated. It's unknown whether Apple is holding the majority of inventory for its own retail stores, or whether the new handset will be spread thin between Apple itself and its carrier partners. 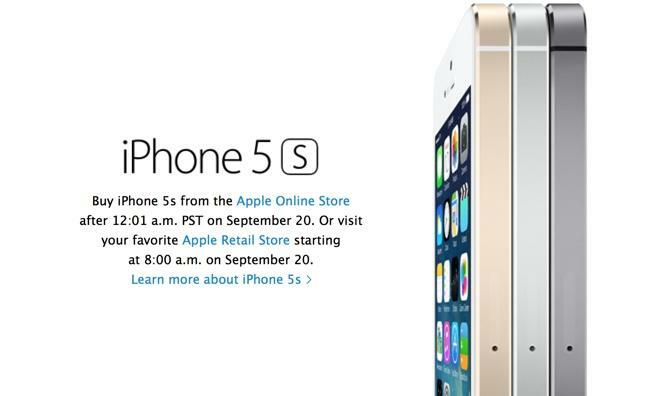 Regardless, Apple is not accepting preorders for the iPhone 5s ahead of Friday's launch, a fact that had already suggested to many observers that supply will be limited this weekend. Preorders for the iPhone 5c did begin last week, and carrier-subsidized models appear to remain in healthy supply from Apple's online store. The new iPhone 5c features many of the same components as last year's iPhone 5, but sports a new polycarbonate back that is available in five colors: green, blue, yellow, red and white. Both the iPhone 5s and iPhone 5c are launching on all four major U.S. carriers this Friday: AT&T, Verizon, Sprint and T-Mobile. The devices will also be available in Australia, Canada, China, France, Germany, Hong Kong, Japan, Puerto Rico, Singapore and the U.K.